Guillermo Del Toro and Chuck Hogan’s critically acclaimed novel, The Strain, was an instant hit. It was the first in a trilogy of books depicting one of life’s biggest supernatural fears: vampires. Not the sparkling vampires seen in pop culture today. No, vampires that look like the threat they should be. Dark Horse Comics, in a partnership with Del Toro and Hogan, are telling the story of The Strain in the four-color medium of comics. Does the novel series translate well into the world of sequential art? 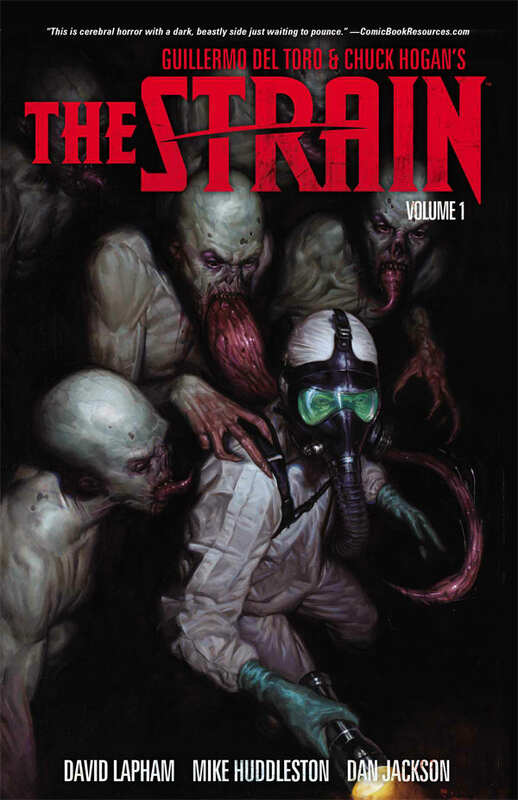 In The Strain Volume 1, we get the first six issues of the chilling series, and what a series it is. Here’s the scoop: a Boeing 777 has went dark on the runway, with no communication to the outside world. Enter the Center for Disease Control’s Dr. Ephraim Goodweather and his team, who arrive to try to see what exactly is going on. Almost all the people on board are dead; with no signs of what happened, and those still alive have no memory of what happened. One thing is for sure; no one suspects it to be vampires, save one man who seems to know exactly what’s going on. The story has origins that go back during a much older and simpler time, all which makes the book that much more eerie. David Lapham does an exceptional job on this graphic novel retelling, adapting the novel into a more visual form. Mike Huddleston provides the artwork, which is much more angular than most comics, which is a good thing. I would say it has a Mike Mignola flare to it, and is definitely, uniquely a comic book. Personally, I love it when the art in a book is more angular and comic-like than more like a hand drawn photo that some artist use as an approach. The art style fits the book perfectly, and the covers are so top notch, I am very glad they included the cover art in this collection. Plus, his artistic interpretation of vampires is down right scary. This collection of the first six issues of the series is an amazing read. For me, these vampires are worst than the 30 Days of Night variety, mainly based on the monstrous appearance. Vampires should be the things of nightmares, and The Strain packs plenty of brain burning images in your head with its highly violent and destructive vampires. Del Toro and Hogan worked closely with Dark Horse on this to make sure everything came together, and wow did it come together. If you want a book that will make you afraid to shut the gate at night, you have found it. Highly recommended, I give The Strain Volume 1 a perfect @@@@@ out of FIVE. Previous Only 44 Hours to Go Fund The Goon Movie on Kickstarter!